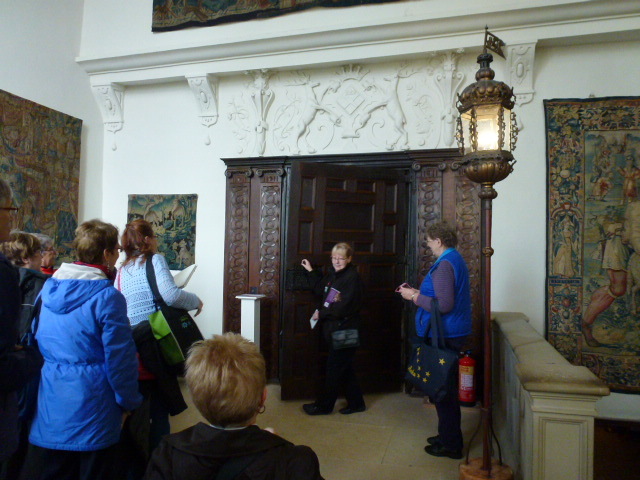 Our textile group, on a special guided tour, have come to visit 16th C. Hardwick Hall to see embroidery of the same time. Bess of Hardwick, Countess of Shrewsbury, the richest lady in Britain (after Queen Elizabeth 1) built the Hall. 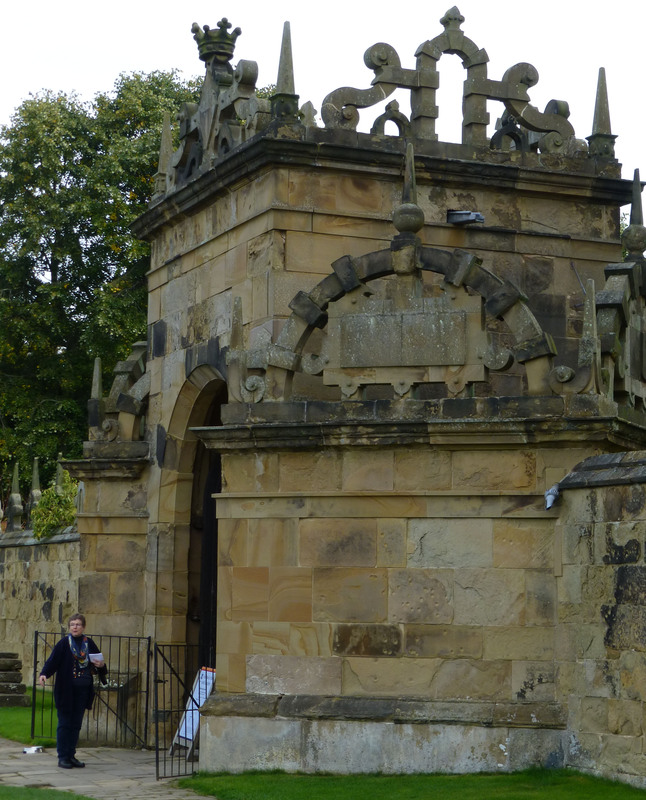 As our coach winds up a hill on the Derbyshire road, we catch a glimpse of the top of the parapets of Hardwick Hall. Bess’s stone initials boldly adorn the rooftops. The house is magnificent and the finest of its time. The house was reputed to have more glass than wall – very unusual and expensive at the time. 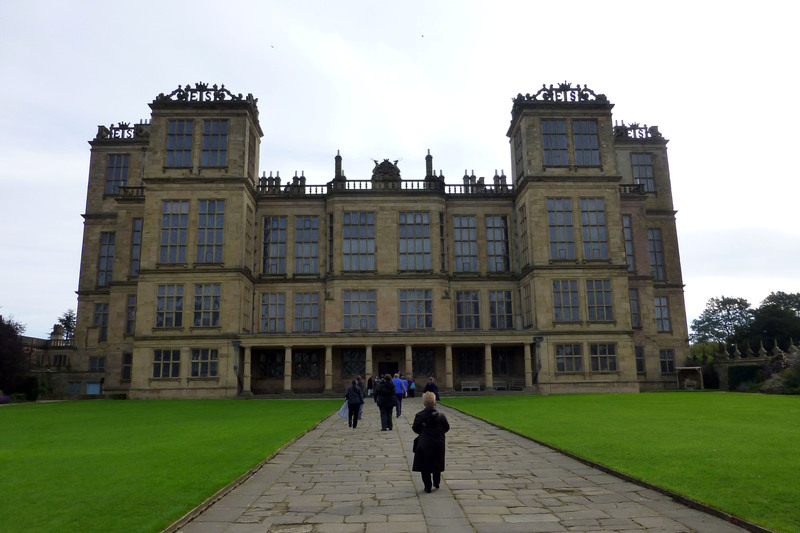 There are 3 stories in Hardwick Hall. The main floor has the lowest ceiling, the second floor with a higher ceiling and the 3rd story has the highest ceiling in the house. People with the highest status were on the upper floors. 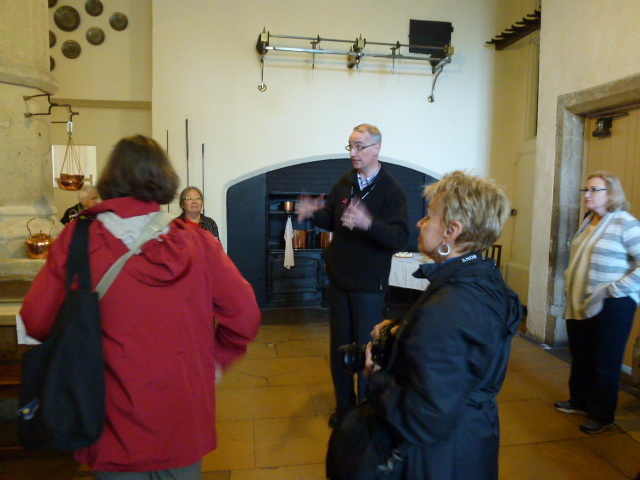 We are met by our guide, Steve Toons who welcomes us into the Entrance Hall. We are seated at a long trestle table about 20 ft. in length. 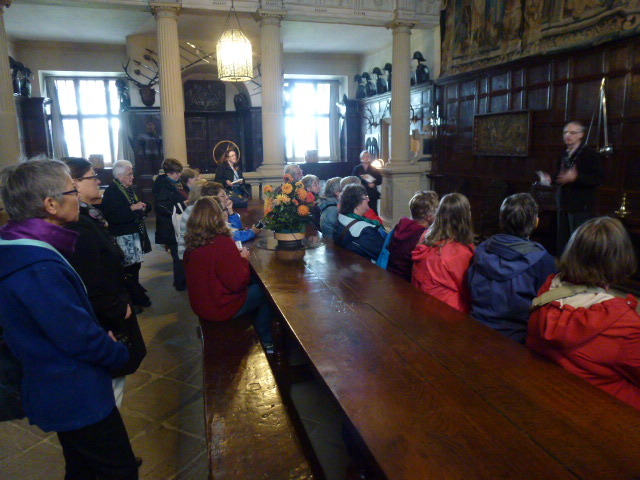 The door is closed loudly behind us and we are spellbound while Steve tells us fascinating stories about the family and the house. Steve is not an ordinary guide. He makes the stories come to life. It feels like we are being prepared to meet Bess. 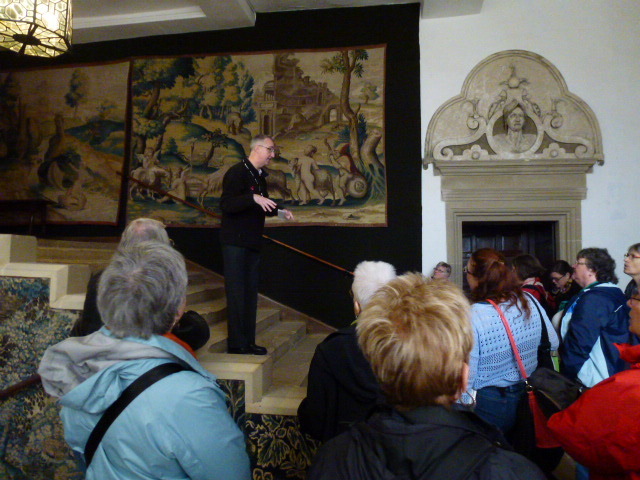 Soon Steve leads us up the cascading stone staircase explaining about the tapestries as we ascend. So many rooms to see, each more interesting than the last. 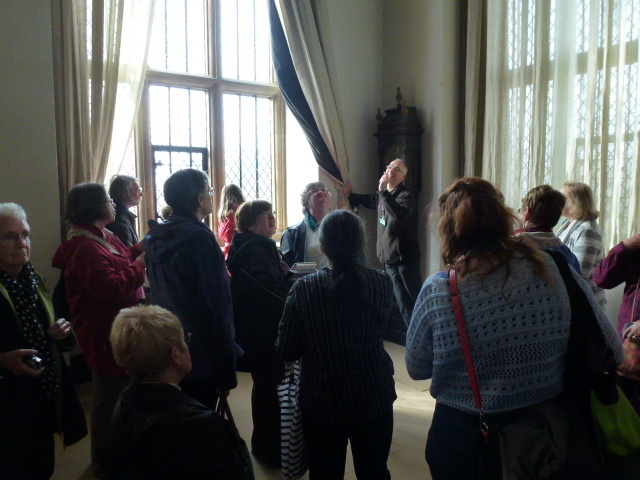 We reach the Long Gallery and the Great Stateroom where we are met with more visual delights and stories. We feel Bess’s presence as we move from room to room. 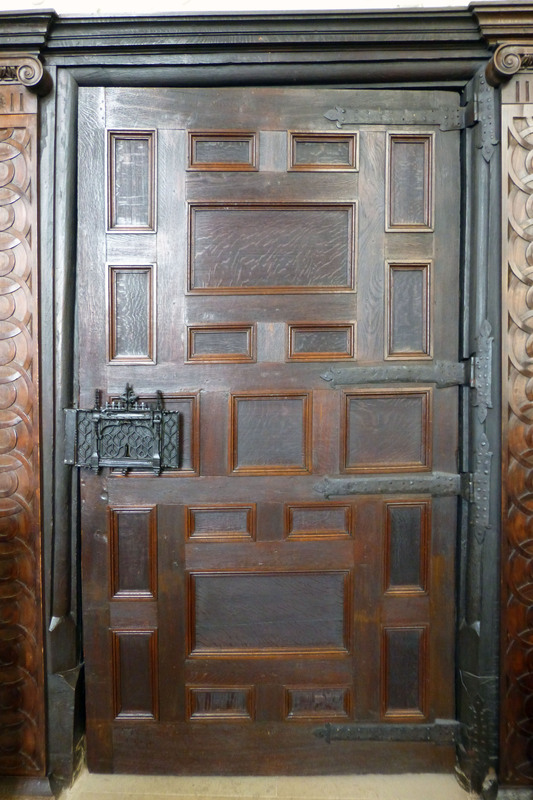 It is not inconceivable that Bess or one of her ladies might pop out of a passage to invite us to tea. 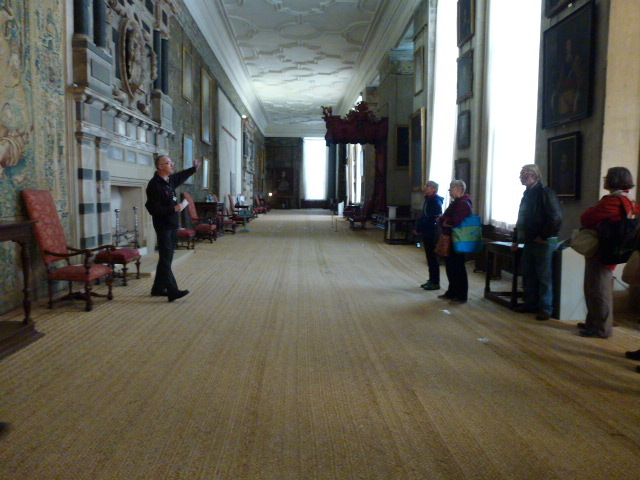 Long Gallery – This is where famous painted portraits hang. Traditional rush matting is made for the floor. The scent of it is magnificent. 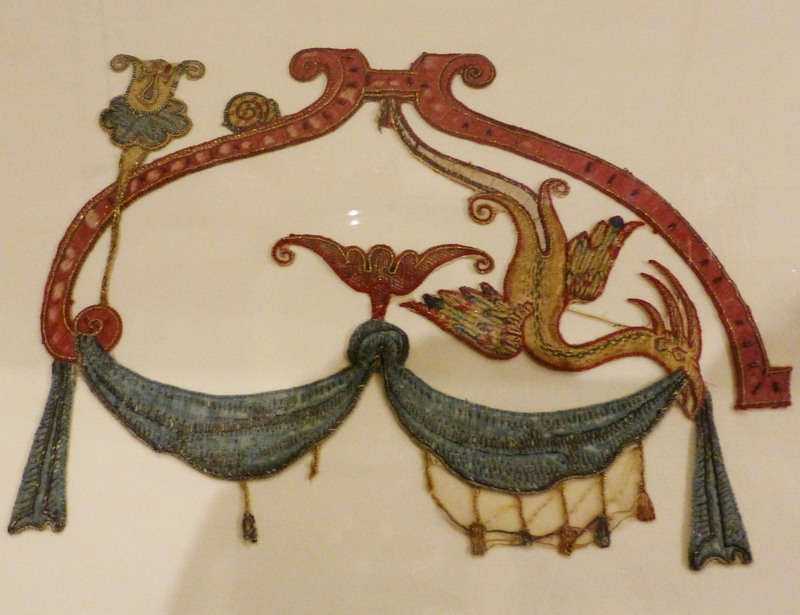 Last but not least, we came specifically to see the textiles, mainly the embroideries and we were not disappointed. 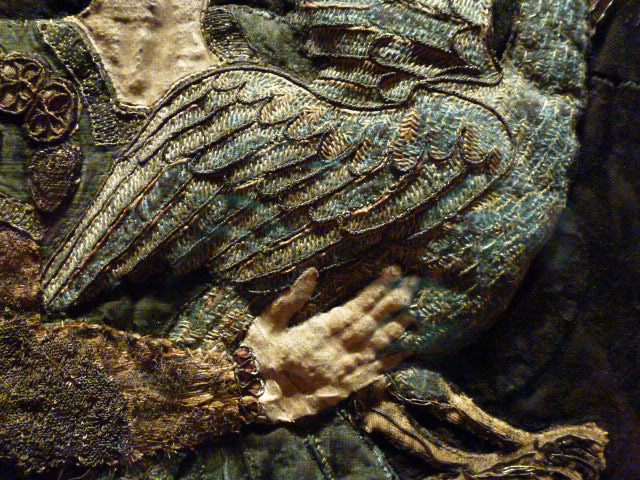 To see the textiles within their context was invaluable. 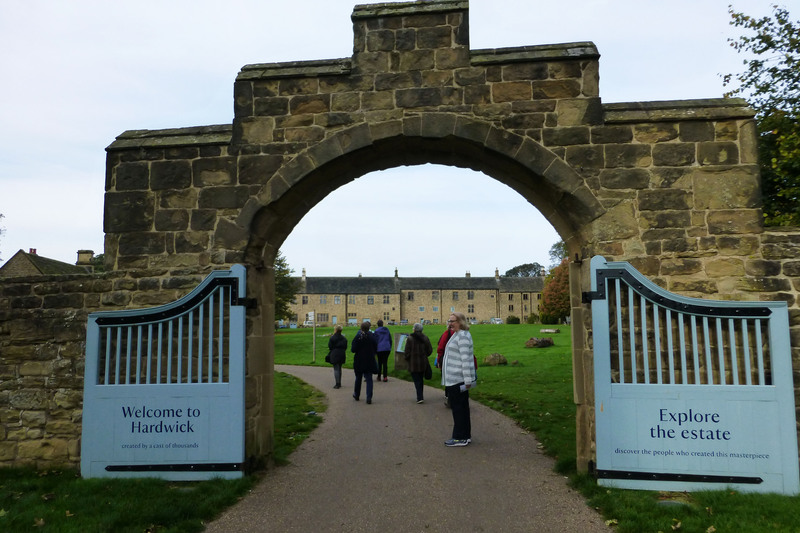 Hardwick Hall is rightfully famed for its extensive and valuable collection of Elizabethan needlework – 16th/17th Century. 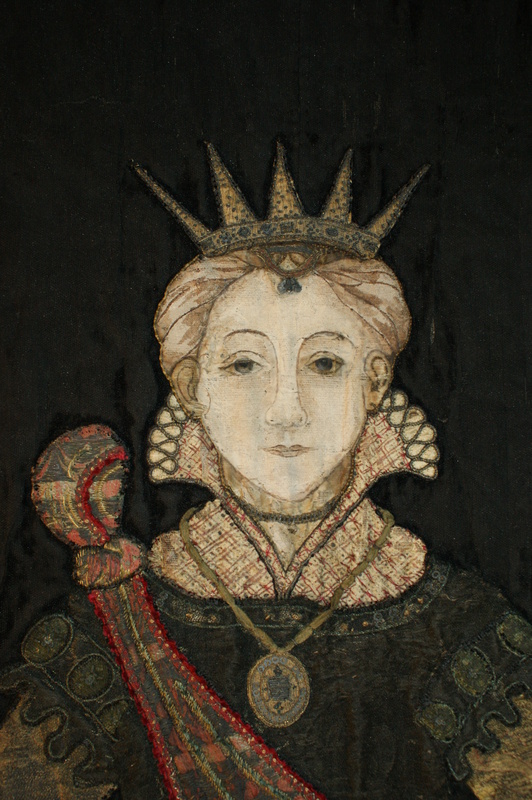 Bess of Hardwick, Countess of Shrewsbury, left her heirs explicit instructions for the care of her collection which was deemed to be more valuable than the house itself, ‘have speciall care and regard to p’serve the same from all manner of wett, mothe, and other hurte or spoyle thereof. As a result, not only has the house survived the ravages of the ages, but the textiles have survived in miraculous condition. 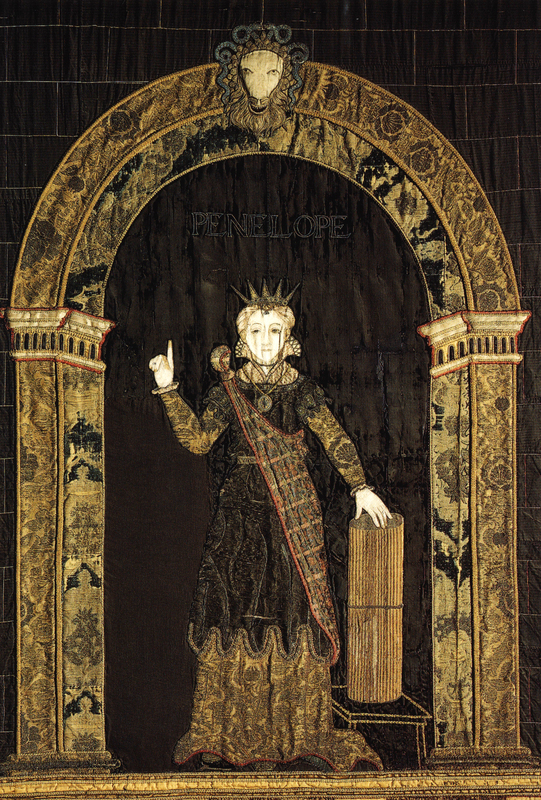 A special c.1570 appliquéd embroidered hanging of Penelope, which is one of four hangings in Hardwick Hall has just had conservation work done on it. The hanging had to be shipped up and taken to the The National Trust Textile Conservation team at Blickling Hall. Click here to see how they did it and watch a time lapse photography video. 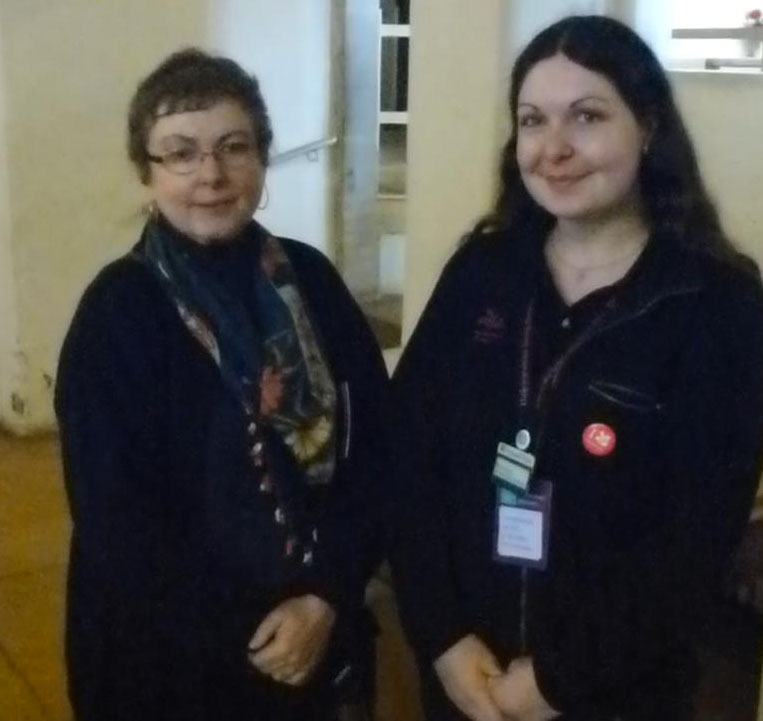 To my surprise, Ellie, a Conservation Assistant who writes a blog about her work at Hardwick Hall is there to meet us in the Kitchen. I follow Ellie’s WordPress blog and feel like I have already met her, even though we usually have an ocean between us. What a pleasure! Another treat for those of us who couldn’t be along. I found the video of the conservation work very interesting. Thanks for including me again Gail! How interesting to enter and explore the house as we did when we visited. 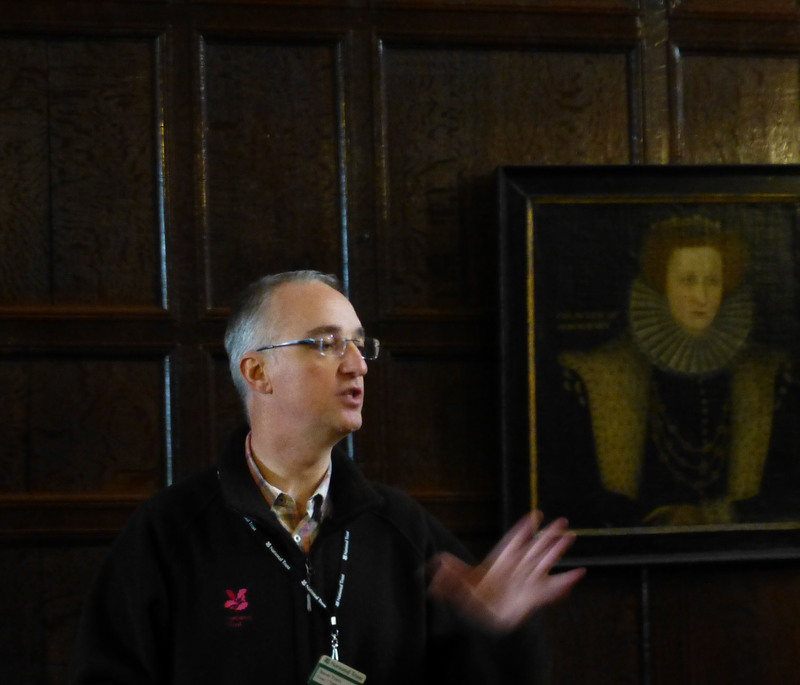 It was like we were being led to the center of the house where Bess still resides through her portraits in the long gallery. There are a couple of biographies about Bess titled Bess of Hardwick: Empire Builder and Bess of Hardwick First Lady of Chatsworth both written by Mary S Lovell and published in 2006 and 2005 respectively, probably the same content with different publishers. Both are readily available in used paperbacks and Kindle editions. I am adding to my wish list!